Researchers at the Hebrew University of Jerusalem have developed a miniature image-guided robot for use during keyhole neurosurgery. The MiniAture Robot for Surgical Applications (MARS) was designed and developed by Leo Joskowicz and his colleagues at the Hebrew University’s Computer Aided Surgery and Medical Image Processing Laboratory. It measures 5 x 5 x 8.5 cm and weighs just one quarter of a kilogram. 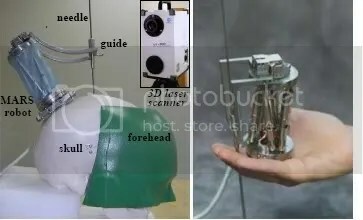 The MARS device can be mounted on the patient’s head using a clamp, or attached directly to the skull with two small screws. It positions itself with respect to the structures being operated on. It is programmed to do so using data obtained pre-operatively by computed tomography (CT) or functional magnetic resonance imaging (fMRI). The robot can then be used by surgeons to target neuroanatomical structures. This targeting is at least as accurate, if not more so, than that of existing neurosurgical robots – structures in the brain can be targeted to within 1 mm. This will provide improved dexterity for surgeons as they guide their instruments towards target structures in the brain. MARS is already being used for spinal and orthopaedic surgery, and has proved to be safe. It could also be used for procedures such as brain biopsies, the draining of cerebral hemorrhage, and the insertion and placement of catheters or implants containing electrodes. Fantastic post. Thanks for writing it!